Board Chair José B. Carrión has recused himself from the debt investigation process. 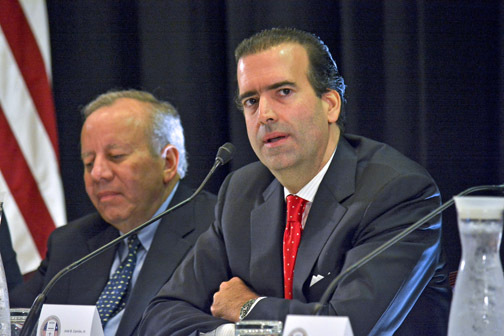 The Financial Oversight and Management Board for Puerto Rico issued a request for proposals (“RFP”) from parties interested to be retained as an independent investigation team to probe Puerto Rico’s debt and its connection to the current fiscal crisis. The independent investigation team will report to the Oversight Board’s Special Investigation Committee, composed of Members Ana Matosantos, David Skeel and Arthur González, the federally appointed body said. The deadline for responses to the RFP is 5 p.m. Aug. 23. (iii) a review of Puerto Rico’s debt issuance, disclosure, and selling practices, including its interpretation of Puerto Rico’s constitutional debt limit. Proponents will be evaluated and selected based on professional qualifications, competitiveness of their economic proposal, completeness and quality of response to the RFP, relevant experience in conducting investigations, knowledge and experience in securities law, knowledge and experience in the municipal bond market, knowledge of government budgeting and fiscal management and ability to commence work immediately, the Board said. Meanwhile, the agency confirmed that despite announcing he would participate in the process, Board Chair José Carrión has decided to step down from the Special Investigation Committee given his family’s ties to Banco Popular. “ While Mr. Carrión does not work for or own any stock of Banco Popular, he nevertheless decided that it was in the best interests of the investigation for him to eliminate any distractions before the Independent Investigation Team and Special Investigation Committee begin their work,” the agency said. The investigation’s findings will be made public. The RFP may be downloaded from the Board’s website: www.oversightboard.pr.gov under the “Documents” section. Hey Buddy!, I found this information for you: "OBoard issues RFP for independent investigation team". Here is the website link: https://newsismybusiness.com/oboard-independent-investigation/. Thank you.